One of those truly perfect books where an ingenious premise is actually pulled off, and with style! Absolutely pitch perfect in its depiction of the Golden Age of Monster Movies, not to mention small town life in the 1950's, and just well . . . the trials and tribulations of being a teenage girl! Loved this, and really want a Lucky-13, I mean Pan-Cake, of my own! Being a fan of Heidicker's first novel, Cure for the Common Universe, excitement to delve into his next was not sparse. Heidicker has done it again. He's the real deal. This book is better, more inventive, and more "out there" than, not just his first book, but most books on that market! All gushing aside, the setting for this new story is a world that is both terrifying and lovely, you want to be in it, and yet, you're glad you're not. The threats are horrific, fascinating, and energizing... the Being a fan of Heidicker's first novel, Cure for the Common Universe, excitement to delve into his next was not sparse. All gushing aside, the setting for this new story is a world that is both terrifying and lovely, you want to be in it, and yet, you're glad you're not. The threats are horrific, fascinating, and energizing... they feel like the all too familiar "boss battles" from one's favorite video game... ironic that this one isn't about video games! It get's top scores for setting; 1950's/60's where all those bad sci-fi flicks are real is a super cool idea! I have no real complaints about the characters. But... there were a few things that leave me less than satisfied. I kept feeling like there was/should be be commentary on various social issues. Woman's place is society, how much space women (literately and figuratively) take up, whites vs non-whites, PTSD, etc. And it was almost there but it wasn't really there; I was left wondering if I was trying to find these messages, or if the author had commitment/communication issues regarding these topics. I was also hoping for a standalone. The ending really leaves you feeling like there should be and will be more to come. Which... Had I left like that was coming more than 5 pages out... Might not have bothered me. But it mostly felt like it was a last second add-on. I NEED THIS BOOK IN MY LIFE ASAP! Attack of the 50 Foot Wallflower is thoroughly weird, slow, and entertaining and should appeal to any lover of sci-fi oldies. Phoebe's narrative is believable and relatable, every man in this book is a creep and you feel as uncomfortable as Phoebe, but for the American 1950/1960's era there really was no mention of racism save for a "no coloreds" sign. All of Phoebe friends and family are really open-minded besides thinking that Native-Americans are "godless and sinful." 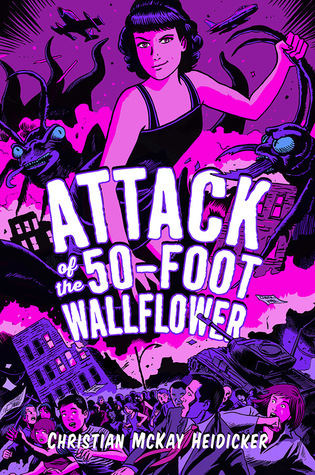 Okay ... What I'm trying Attack of the 50 Foot Wallflower is thoroughly weird, slow, and entertaining and should appeal to any lover of sci-fi oldies. Phoebe's narrative is believable and relatable, every man in this book is a creep and you feel as uncomfortable as Phoebe, but for the American 1950/1960's era there really was no mention of racism save for a "no coloreds" sign. All of Phoebe friends and family are really open-minded besides thinking that Native-Americans are "godless and sinful." Okay ... What I'm trying to say is you have to have some suspension of belief. I'm just surprised Phoebe didn't have any preconceived notions about different races and a blink-and-you-miss-it (view spoiler)[ reference to gayness (hide spoiler)]. Overall, it was good. Sometimes, Beth seemed a little too perfect and her story's a little open-ended (view spoiler)[ she's from the future??? (hide spoiler)], and I don't really care too much about the forced (view spoiler)[ Phoebe/Lear connection (hide spoiler)]. Still, a nice change of pace from other YA stories with a cool cover.